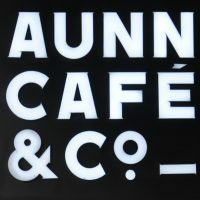 AUNN Café & Co (an abbreviation of All U Need Now), which opened in early 2015, is a café, lifestyle store/design showroom and gallery space spread over three floors underneath a hotel on Shanghai’s busy West Nanjing Road. I was tipped off to its presence by Jennifer, a Shanghai resident who I met in And Coffee, and who gave me a long list of places to try. AUNN café itself is the largest of the speciality coffee shops that I visited on my trip in 2016, spread across the ground floor of the building, the entire front given over to windows, complete with a coffee terrace outside on the busy road. When the weather’s warm but less humid than the October day I was there, the windows can be pulled back to create an open terrace. The coffee comes from Little Bean in Pudong, with green beans sourced from Nordic Approach. There’s a standard, espresso-based menu, plus cold-brew and what AUNN calls “naked” coffee, filter to you and me. There are two single-origins available via the V60, as well as batch-brew if you’re in a hurry. There is also a small selection of western-style cakes and pastries if you’re hungry. On the northern side of West Nanking Road, on the ground floor of the building housing the Fairmount Gallery Hotel, AUNN Café & Co has the advantage, unlike many of Shanghai’s speciality coffee shops, of being very visible from the street. You can enter via the hotel lobby, which leads you into the right-hand end of the coffee shop. Alternatively, there’s an entrance direct from the street at the far left-hand end, where you’ll find the L-shaped counter dead ahead, its gleaming Kees van der Westen Spirit espresso machine and twin Mythos 1 grinders drawing you in. Don’t get too drawn by the beautiful lines of the espresso machine though, since you actually order at the left-hand part of the counter, where a row of cakes in a glass display case lead the way to the till. The seating is to the right, arranged in long rows. First is a row of round, two-person tables in the windows. A shorter, more eclectic row is behind that, with large, four/six-person round tables alternating with smaller ones, which gives way to a wooden bench with eight round, two-person tables in front of it. Behind that, a pair of large, square concrete pillars hold up the ceiling with a long, eight-person communal table between them, while on the window side of the second pillar, a flight of steps leads upstairs, where you’ll find Wondullful Dept, the lifestyle store/design showroom, which you’re free to browse. The upper floors above Wondullful Dept were closed when I visited, a state of affairs which persisted when I popped back in December 2017. Back downstairs, two long, wooden benches run the width of the store against the back wall, each bench having six round, two-person tables in front of them. The outside seating is similar, with a row of two-person tables along the outside edge of the terrace, which is raised slightly above the level of the pavement. On the inside of the terrace, against the windows, are two more concrete pillars, matching the two inside. These create two generous bays, the first of which has a pair of two-person tables, while the second has three of them, seating provided by old flight cases, while there’s a final flight case to the right of the door, but this time with no table. Unlike many of the smaller coffee shops I visited, AUNN is air-conditioned, which on the day I was there was essential. With its high ceilings and spacious layout, it has a very modern/western look and feel, aided by the furniture, some of which is imported from the Netherlands and Denmark. There’s plenty of natural light from the windows, supplemented by large, industrial-style lighting which hangs down from the air-conditioning ducts that run high above you below the ceiling. The piped western music just failed to drown out the shrill whistles of the traffic policeman who was stood outside on the major intersection at the corner. I shudder to think of the volume you’d experience if you sat on the terrace! I started with a very smooth and sweet cappuccino, the coffee going well with the milk. Given a choice of small or large (plus the option to have it iced) I ordered small and hot, being rewarded with something akin to a flat white. The milk was beautifully steamed and held the pattern all the way to the bottom of the cup, something I found a lot in Shanghai. I followed this with a pour-over, selecting a Kenyan single-origin (the other option was Colombian). This was wonderful, a very juicy brew, bursting with flavour and more than holding its own as it cooled. For a different view of AUNN, try local blogger, Sugared & Spiced. If you want to read more about my trip to China, including the other Coffee Spots I found along the way, there’s a page dedicated to the trip. This entry was posted in Coffee Shops, Coffee Terraces, Evening Opening, Laptop Friendly, Late Opening, Shanghai and tagged China2017, include by Brian Williams. Bookmark the permalink.